I also came across these, witch are a new class in tres called "CHitSpang"
I believe Draco knows more about these. But its very interesting! 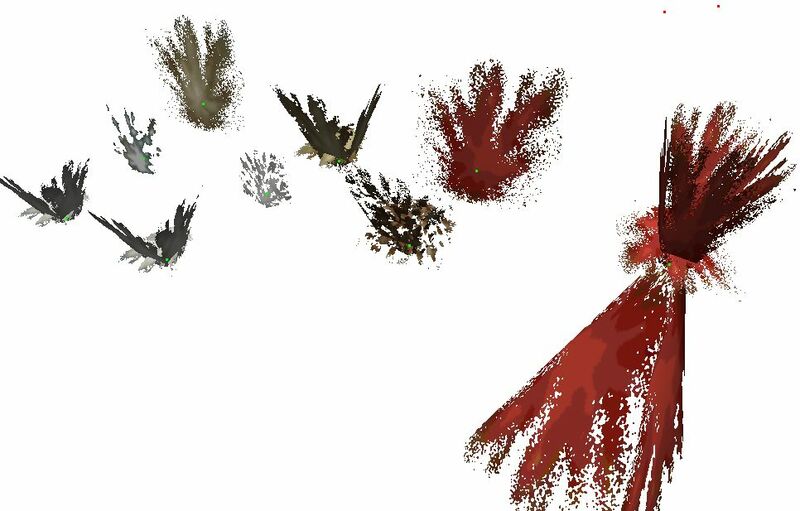 They appear to be meshes meant to represent collision impact "dust", which is what the particle rendering is for. It's possible CHitSpang was only needed until a particle system was created. I guess maybe they didn't think they could do particles at first? Oh and the names: "FMFHitSpangDefault00-00"
F seems to mean Fixed. MF is thought to mean Muzzle Flash, which is quite odd here.. And then the rest of the name describes the specific object, which are actually a lot like the CParticle objects. We can see definitions of sound materials, as well as SCALE values (otherwise only seen to be manipulatable via ASA animation), and also a Count value! Hmmmmm.... I'll bet machf will have more to say about this. WOAH! Aren't CHitSpang classes still in the retail executable? We should so get experimenting with those things! The hyper-realistic muzzle flash could simply be a by-product of the Dev's experimenting with their 24-bit capability, after all, Trespasser once worked solely with 24-bit images, but this ate up Graphics memory so fast they had to swap down to 8-bit palettes. Excellent find, Rex. And yes, someone needs to experiment with getting them to work. These are in Lab - maybe they DO currently work in that level. Should try this in both 96 and 116d. Aaaaand I think someone like you should be the one to do it. I'd like to point out that, at least in some of the Beta levels (can't recall off the top of my head) that the muzzle flashes are different from the retail. They looked more transparent, similar to those in that screenshot above. MORE transparent? How do you mean, Slug? The ones in retail all use 24-bit (semi-transparent) textures.. Most of the beta seems to as well except that PV and I think 1 other level have 8-bit muzzle flashes.